It all came to surface as the culmination of a personal vendetta between President Maithripala Sirisena and Prime Minister Ranil Wickremesinghe. The country at large knew of it when the President sacked the Prime Minister and appointed his arch enemy, the former President Mahinda Rajapaksa, in his place in the evening of 26 October, according to Indian media, in a hush-hush swearing-in ceremony. The ruse used by the President was that a few minutes ago one of the partners of the unity government, United National Freedom Alliance or UPFA, had withdrawn officially from the government making the prevailing national government non-existent as far as the Constitution was concerned. A national government could have more than 30 cabinet ministers but once it has fallen that cabinet had to be re-numbered to be within the provisions of the Constitution. This should have been done in consultation with Wickremesinghe but the President had chosen to do it solo claiming that he had discretionary powers under the Constitution. I have pointed out in a previous article that the President would have been correct had Sri Lanka been a monarchy in which the monarch could use discretionary powers but still subject to limitations imposed on him by a code of ethics. But Sri Lanka was a republic and it was a misconception to talk about discretionary powers within the framework of a republic. That was because in a republic the President is simply the one presiding over the entity of people making the republic and he does not have powers which are not being enjoyed by others in the entity (available at: http://www.ft.lk/opinion/The-flash-election--A-political-way-out-or-an-instance-of-one-mistake-leading-to-another-/14-666609?fbclid=IwAR1gldhlQaGTIZEwaf2eKA98zW6PA8OSE9cnxBKGee2iCl1bqOFIyf1qZx4). Hence, he who had been sworn into the Presidency under the Constitution of the Republic should have consulted the stakeholders concerned. In the present case, that would have been Wickremesinghe who was the incumbent PM. The President’s ploy had been to appoint Rajapaksa and then work jointly for getting a majority for him in Parliament. A series of horse-trading took place behind the scene and some had accused of being offered financial bribes as well as preferred Cabinet portfolios to crossover to Rajapaksa camp. Later, the President himself admitted this when he justified the dissolution of Parliament claiming that there was a price fixed for MPs. Hence, he implied, to punish them, the present Parliament should be brought to an end. He continued to appoint Ministers for Rajapaksa Government in a number of rounds but it was later apparent that the required numbers could not be made-up. Meanwhile, the sacked PM Wickremesinghe continued to occupy the official residence of the Prime Minister, Temple Trees, claiming he was still the lawful PM of the country. This led to having two PMs but no government in the country. That man-made constitutional crisis had enormous economic costs and as I had pointed out in a previous article, needed to be fixed forthwith (available at: http://www.ft.lk/columns/With-this-man-made-Constitutional-crisis--economy-will-be-the--casualty--resolve-it-quickly-or-peris/4-665587). But there was no heeding to sanity and it was the case of making one mistake after the other. Parliament was prorogued when Wickremesinghe tried to show his power; then due to the massive public and international protests, it was reconvened two days before the appointed date. Then, when it was apparent that on reconvention, Rajapaksa would have been defeated in a no-confidence vote, the President took some cover under separate provisions in the Constitution and decided to dissolve Parliament fixing even the date for the General Election. His mistake there has been not reading the Constitution as a wholesome document but only the provisions that would have been supportive of his action. This mistake he had made had been even endorsed by some of the lawyers supporting him. However, a Constitution is not like a reference book which is looked at only for the reference sought. It is a document governing the fate of a nation and therefore, should be read as a wholesome document. In that Constitution, there is a prohibitive section which had taken off the general powers of the President to dissolve Parliament four-and-a-half years before its first sitting unless Parliament in a two third majority voting had asked him to do so. When one reads the Constitution as a wholesome document, one has to ascertain why that particular prohibitive section has been introduced. That was because of the recognition that for Sri Lanka to adopt a certain medium term policy package without being interrupted, the sitting Parliament should have a minimum period of four-and-a-half years to do so. The President should not have read only the sections relevant to him and ignored the prohibition that had been imposed on him by the Constitution for a good reason. If he had wanted to dissolve Parliament, he would have asked Parliament to give him powers through a two third majority in terms of the Constitution. The unilateral dissolution of Parliament had deepened the crisis prompting aggrieved parties to seek a ruling from the Supreme Court about the constitutionality of President’s action. The Court has issued an interim injunction on the implementation of the dissolution order pending a full inquiry to be conducted early December. In the meantime, Parliament which was reconvened in terms of President’s previous order had passed by majority, using one of the methods which Parliament uses to pass a law, namely, by the voices heard by the Speaker, three motions affirming that Parliament has no confidence in Rajapaksa and his government. In terms of the Constitution, once such a no-confidence motion is passed by majority vote, the government in power is automatically dissolved requiring the President to appoint another who can command the majority in Parliament. But the President made another mistake by rejecting the motions and asking Parliament to go for stricter methods of passing such motions. When the Wickremesinghe group yielded, Parliamentary sessions were disrupted by unruly supporters of the Rajapaksa group. This appalling lawlessness in Parliament was witnessed live by people both in Sri Lanka and outside. To the outside world as many diplomats had tweeted, it was a deplorable situation. The sum conclusion is that it was a vote of no-confidence against the President who holds the Law and Order portfolio of the Government. This is another mistake committed by the President without fully understanding its gravity. The President has all the reasons to dislike Wickremesinghe. One contentious area was the blatant attempts made by Wickremesinghe to sweep under the carpet the infamous Central Bank bond scam. When it took place on 27 February 2015, the President was away from the country and when it was brought to his notice, he ordered his Secretary to appoint a Commission of Inquiry into the scam immediately. But Wickremesinghe checkmated the President by appointing three lawyers close to him to inquire into the incident. The report castigated some officers in the Central Bank but gave clean certificate to the Governor who had been a close ally of Wickremesinghe.By protecting the Governor, he played the roles of the proverbial deaf, dumb and blind monkeys simultaneously. When the matter reached a critical stage, the President had to come on the national TV just before the General Elections in August 2015 and reveal a secret to the nation. He had in all sincerity advised Wickremesinghe not to have his ‘Mr Clean’ name spoilt by continuing to protect the Governor in question. But this was not heeded to. The opposition went to town on the Central Bank bond scam in election platforms making it a national issue, surely an embarrassment to a government which had come to power on the promise of establishing a corruption free society. It is the belief of many that UNP lost five or six seats in Parliament because it could not convince the voters, especially those cosmopolitan ones, that it was guilt-free. Unfortunately for Wickremesinghe, bond scams continued in greater volume and intensity angering the market. His government was totally oblivious to it, though it lost its reputation. The President who was dismayed by the unsavoury developments sought to rectify it through the Parliamentary Committee on Public Enterprises or COPE but the report was partially killed by those members who had represented UNP on the Committee. Pressure was brought on the Chairman of COPE who had come from JVP; when he refused to relent, the strong message in the report was diluted by members belonging to UNP by adding a set of footnotes prompting the Chairman to pronounce that it was not one report but two reports to be read separately. The President had to intervene again when attempts were made to cover up the COPE report by UNP led by Wickremesinghe. The intervention was in the form of appointing a Presidential Commission into the scam of which the report is now out. It had implicated the complicity of the Governor, the primary dealer company owned jointly by his son-in-law and its senior officials, though there was no reference to Wickremesinghe or his senior ministers. When the term of the Governor was over, Wickremesinghe tried his best to reappoint him for a further term angering the President. Wickremesinghe’s attempts were foiled by the firm stand taken by the President not to give him another term. There was another reason for the President to dislike Wickremesinghe. All economic policy decisions were taken by a Cabinet Committee on Economic Management or CCEM headed by Wickremesinghe and the President was kept in the dark in all these matters. He had to complain in public that he came to know many of those decisions concerning the country only when they were submitted to the Cabinet for approval. This is not the way a good governance government made up of two major coalition partners should be run, but despite the complaints made, the President was continued to be ignored in the decision making process. When it became totally intolerable, he decided to scrap CCEM and establish a new National Economic Council or NEC under his chairmanship. 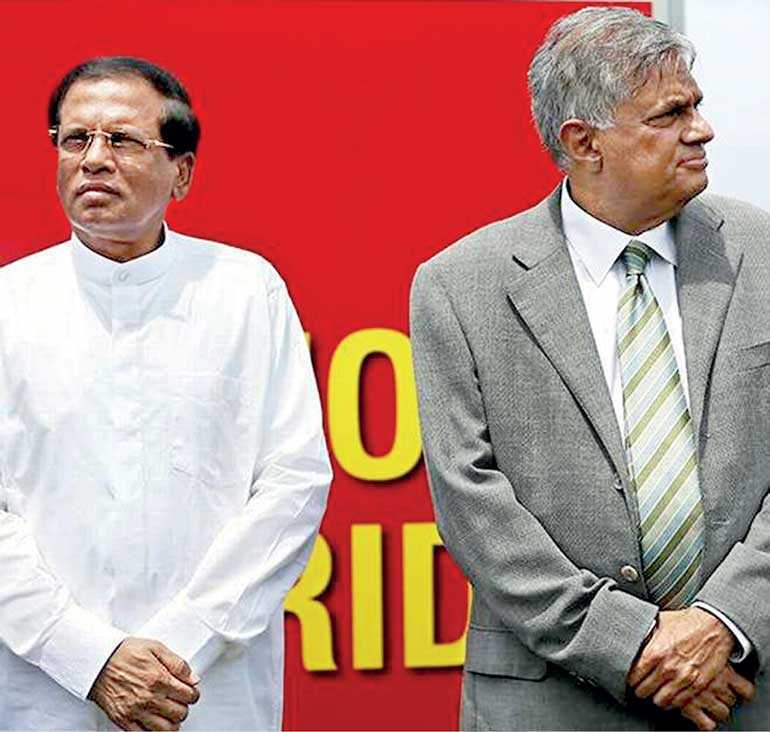 Thus, the rift between the President and Wickremesinghe had a long history and is not something that just emerged on 26 October, on which day the former decided to replace the latter. But now a private vendetta has become a national vendetta and perhaps, with the intervention of Sri Lanka’s international partners, a global vendetta as well. The country’s economy which was already in a deep crisis had begun to suffer in greater intensity. There is no government today and nor there is a mechanism to make public policies except some ‘unsustainable goodies’ being announced by Rajapaksa faction to the detriment of the economy. They can be equated to an instance in which glucose is given in bigger doses to a dying diabetic, though the diabetic may love to have it without knowing its life threatening implications. There is no budget for 2019 and therefore there is no mechanism to continue with the present budgetary disciplining process being pursued by the Wickremesinghe Government. If an interim ‘vote on account’ is presented to Parliament by Rajapaksa, it is likely to be defeated in Parliament since he does not have majority. In that case, his Government will instantly fall. Without a budget or a vote on account, as I have argued in the previous week’s article, there is no prospect for Sri Lanka to repay maturing public debt or paying interest on the existing debt. Most likely, Sri Lanka will have to default, for the first time in its history, its sovereign obligations. Foreign investors have already been nervous because of the blatant violation of the Constitution by the President and the Rajapaksa faction. Already, the markets have added an extra risk premium in the range of about 2 to 5% to existing sovereign debt of the country. What it means is that if the government, no matter whether it is led by Rajapaksa or Wickremesinghe, seeks to go to international markets, it will have to settle for an interest rate, not at 6.5% it enjoyed in the past, but a rate at around 9 to 10%. Borrowing funds at those interest rates to repay the maturing debt is totally imprudent. This personal vendetta between the President and Wickremesinghe has ruined the economy. Yet, discussions by the public in both electronic and print media had been biased, naive and ill-informed. Hence, the President who triggered off the crisis does not get an opportunity to see through its long term adverse consequences. A good example of how the people should analyse the present situation has been given by neighbouring India’s Rajya Sabha TV. In its Big Picture programme (available at: https://youtu.be/Qs2oupk2HKI), the TV station got three intellectuals to analyse Sri Lanka’s situation without bias, prejudice or misinformation. They had noted that the Rajapaksa Government had so far been recognised only by two countries, namely, an unknown Burundi and the muscle displayer in the region, China. The rest of the world has simply isolated him as the Head of the Government. Hence, it was truly a learning experience for the viewers. The wisdom which the President should get from all of us is that he should not risk destroying the social, political and economic fabric of the country by continuing to harbour a personal vendetta. That is not the way a statesman should conduct his affairs. To his credit, Wickremesinghe has on a number of occasions pronounced that he has no problem of working with the President. He is ready to forget the past for the sake of the country. But the President is, to the contrary, going after Wickremesinghe’s blood. Thus, if the President could discern the risks of his stubborn conduct properly, like a good statesman, he would choose to revert to ‘pre-26 October position’ and allow Parliament to select a new PM until it is conducive for the country to have a free and fair election. Right now, citizens who have witnessed in horror the thuggish mob violence unleashed in Parliament by Rajapaksa faction cannot resolve themselves to believe that there would be either freedom or fairness in the elections to be held under that administration.